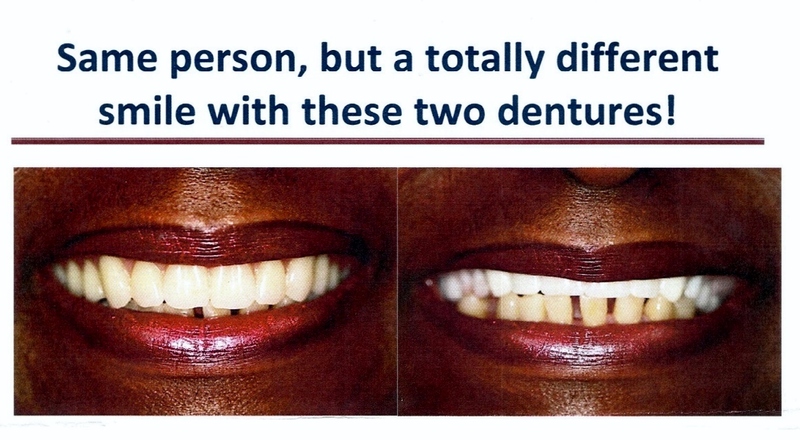 What a difference the right denture can make! What made this incredible difference? Actually, it’s a number of differences, and that’s what makes this total package of change. 1. Facelift?? You might say that she is smiling larger in one photo than the other. Although that is correct, I made a change that made that possible. See how her upper lip in the “before” picture is drooping? By building up her denture under her upper lip, I was able to support her lip so it wasn’t drooping, and in turn, she was able to smile bigger. She didn’t actually have a surgical facelift but she did have a denture facelift! 2. Secondly, I moved her upper teeth in the middle of her smile. Everyone loves to see teeth and generally that is what is thought of when you see a beautiful smile. It’s also what makes you look younger. With some of our older adults, they want what is more appropriate for their age, so I follow a different set of criteria, but most want as much youthfulness as I can give them! 3. Kind and shape of teeth- Look at the biting edge of her teeth. You will notice in the “after” picture that they are not straight across. Older patients generally have worn their front teeth flat from years of use. This is just one of the small components in the scheme of things that give you that aged look as you grow older. We can go either way; it’s all about the look YOU desire. We also used a higher quality tooth here that cost a little more money but the anatomy and the reflection of light within these teeth were worth what it added to the end result. These are also very hard teeth that won’t wear down as fast as others. 4. Shading: Everyone wants white teeth. I like white teeth too, but sometimes it doesn’t compliment. In the “after” denture, we didn’t go as white and therefore it blended better with her lower teeth giving a more natural appearance. 5. To make the overall smile complete, we could have closed in the spaces between her lower teeth. This patient was extremely anxious with dental treatment, and she was just fine with not pursuing the additional treatment needed to close these spaces. We all know that as the years go by, our bodies change. That’s true of the foundation your denture sits on as well. With time, this foundation (or ridge) shrinks and your denture sinks right up under your lip following its base that it sits on. It’s a gradual change that you generally don’t notice, but as it sinks, your teeth are no longer in the middle of your smile. With use, your denture teeth become flat which adds to that aged look. This also causes your jaws to have to overclose to touch each other while chewing and talking because of the sinking and wear. The worst thing is, if you wear that denture too long without changing it, you get used to how close your jaws have learned to overclose. In many cases, we are unable to reverse this overclosure that they have become a custom to. To reposition them to their former youthful position and smile, causes a patient to talk with a muffled sound or causes them to hiss when they say their s sounds. Our goal is to give every person the smile they want, but each individual mouth presents with different obstacles that sometimes dictate what we end up with.